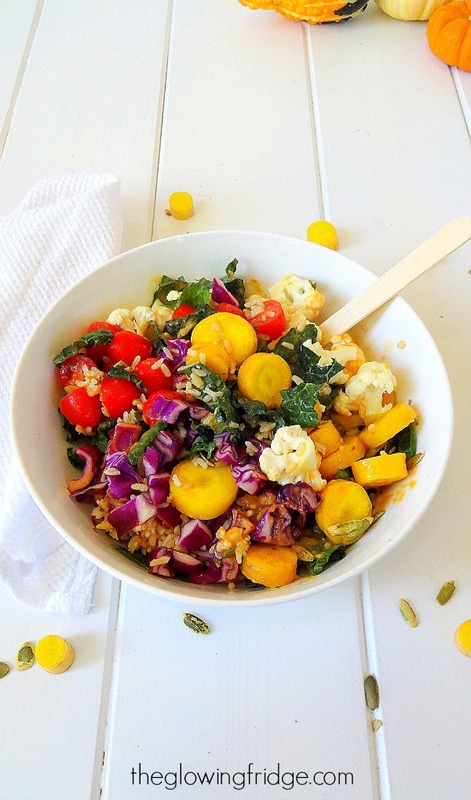 The Kale Glow Bowl with Pumpkin Dressing. 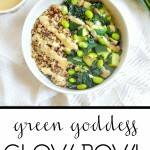 You can never have too many Glow Bowl recipes. They are starting to become my favorite recipes to create, I think it will be a thing now! 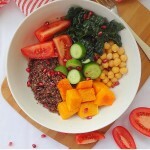 I created the Autumn Glow Bowl in the beginning of October which is amaze as well. If you are wondering what the yellow things are in the picture, they are carrots. From Trader Joe’s. And they taste just like regular carrots. I picked up more of them because they are organic + I’m a sucker for anything bright and colorful, and tasty! Then we have grape tomatoes, crunchy purple (red?) cabbage, cauliflower, red onion, brown rice, pumpkin seeds (pepita seeds) and a whole bunch of dino kale 🙂 I was starving while taking the pictures. I almost just wanted to say screw it and start eating the yumminess already. Kale is the powerhouse of greens. One cup has 5 grams of fiber and only 36 calories. Whatttt. It’s packed with calcium, vitamin A, vitamin K, vitamin C, and antioxidants plus minerals like potassium, manganese, copper, phosphorus and iron. All of which are absolutely essential for good health. Did you know that per calorie, kale has more iron than beef!? 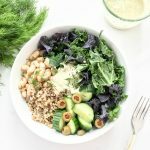 This leafy green is a staple in my everyday eats, whether it be in a smoothie, juice or vegetable stir fry. Kale used to scare me. The thought of eating pure kale without any spinach or romaine?! It used to be a spooky thought. But its so much better when you soften up with a little lemon juice, aka “massage” your kale by squeezing fresh lemon juice on it, mixing it around, making sure all the leaves are covered and then letting it sit for about 5 minutes. This allows the kale to become silky and easier to chomp on, because it initially has that fibrous texture. If you haven’t tried it, I highly recommend it! 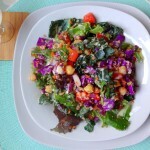 Doing this step makes all the difference for any raw kale salad. 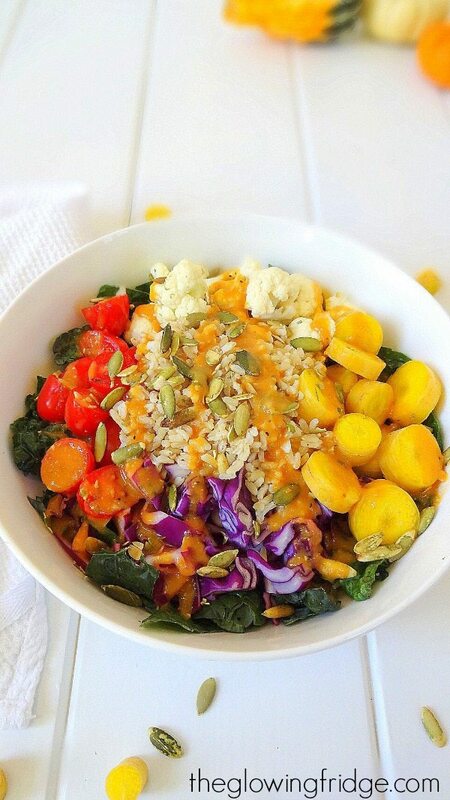 This Glow Bowl has it all and will fill you up. 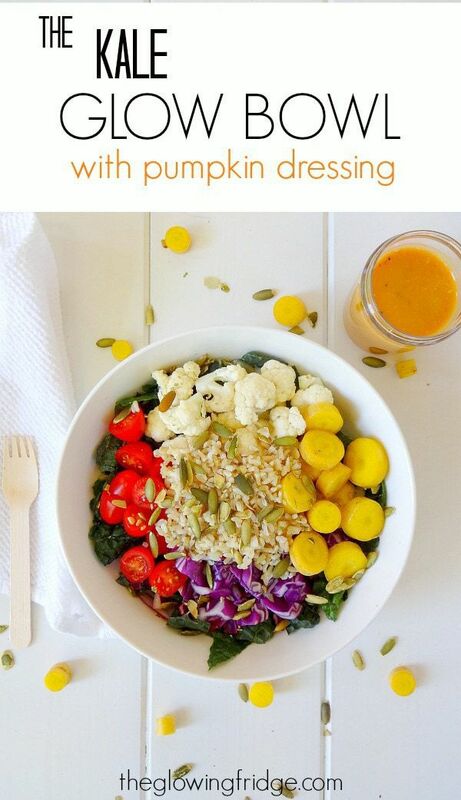 The pumpkin dressing takes it to the next level! It’s creamy, tangy and similar to a vinaigrette. The dressing would taste good with any salad. And it keeps up with the fall theme 🙂 which I’ve been loving. Fall has been extra beautiful this year, right?! At least that’s what it feels like for me. Probably because I have two dogs who melt my heart when they play in the colorful leaves and run around together, usually in their Halloween outfits. I will be sharing pictures of them on Friday! They’ve been rockin their outfits this entire month ha. Is that crazy? Its the cutest.thing.ever. Taz is a sneaky little bear who brings leaves into the house all the time now and rips them apart so the house is covered with little leaf pieces that I’m constantly cleaning up. He is turning 1 in November! And Chuy is going to catch a squirrel any day now, it’s his ultimate hobby. Can’t wait to share pictures of them. Do you dress up your dogs too?! 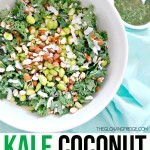 In a large bowl, combine kale and fresh lemon juice, making sure all the leaves are covered. Set aside for 5 minutes to allow the lemon juice to soften the kale. Prepare the dressing. In a small bowl, combine all the dressing ingredients and whisk until well combined. Start to assemble your glow bowl. 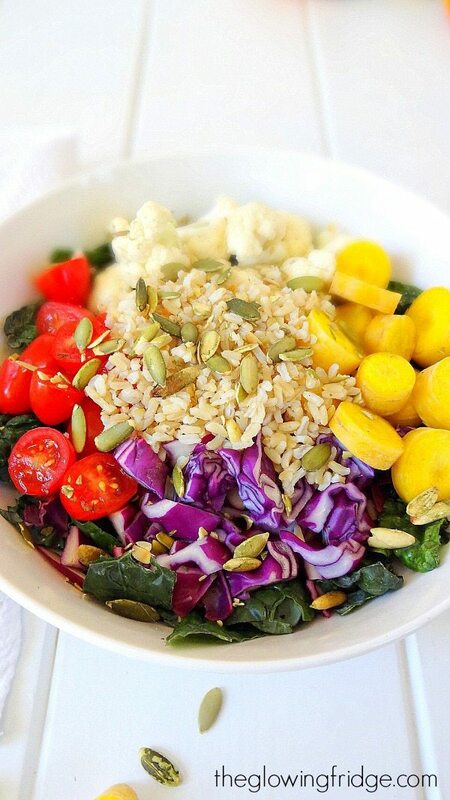 Add the cauliflower, cabbage, tomatoes, carrots, red onion, brown rice/quinoa and pumpkin seeds. Pour desired amount of pumpkin dressing over salad and mix well. Makes 1 large serving or 2 small. I also think raisins would add a nice touch of sweetness to this yummy bowl! Any leftover dressing is good in the fridge for up to a week. What do you think of my new logo? I’m so happy that it’s finalized and it turned out exactly how I wanted! It was quite the process but I think it came together nicely! What exactly do you mean by “puréed pumpkin (not the pie filling)”? Do you use the canned pumpkin puree from Libby’s, or do you puree your own cooked pumpkin? I can’t wait to see your pups on Friday in their outfits! I got my dogs outfits but my littlest one almost chewed his pumpkin sweater apart, haha. 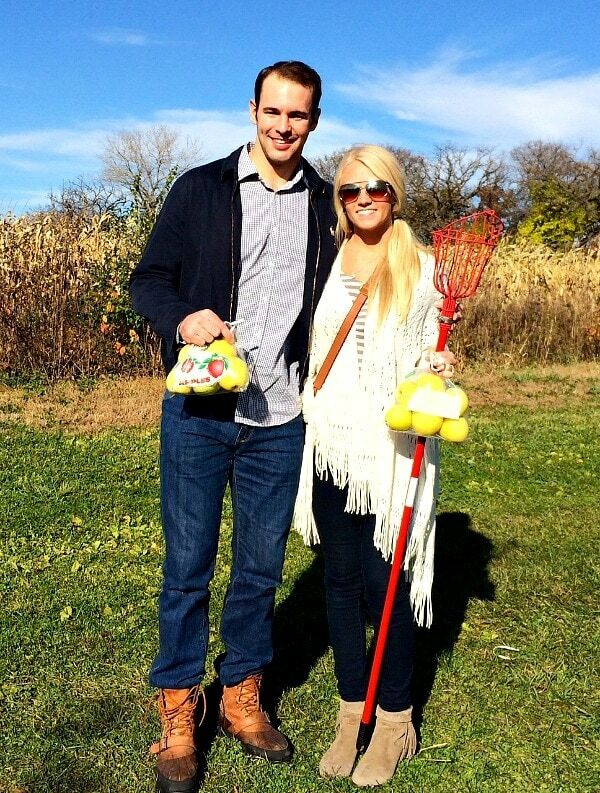 Apple picking looks like so much fun and you kinda sorta look like Carrie Underwood in these pics! I had to do a little double take!